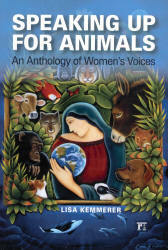 Eighteen women from differing backgrounds offer fascinating personal accounts of their awakening to the plight of all nonhumans. I thought I knew a lot about animals, but this book taught me amazing facts about the intelligence, cleverness, curiosity, playfulness, and social lives of many nonhuman species, regardless of whether they live on land or water. Reading this book made me aware of how little I really knew, and how we humans have isolated ourselves from really observing the special attributes of the other animals who share this planet with us. I’m thankful that I read Speaking Up for Animals and will continue to refer to it. As I’ve said before, “must-read” may be an overused expression, but Speaking Up for Animals truly is not only a must-read, but a must re-read, must discuss and quote, and must give to others to read. Lisa Kemmerer, PhD, is currently associate professor of philosophy and religions at Montana State University – Billings.